Worrying about accidents or safety is not something we really want to do every time we go hiking but it is crucial to think about it and as the saying goes ‘Plan for the worst and hope for the best’. I have been hiking for over 40 years and the most serious issues I have encountered have been blisters, the odd headache and the occasional case of diarrhoea. I don’t consider this to be good luck but rather ruthless planning on my part. When you work in adventure sports you are responsible for the safety of others undertaking sometimes risky endeavours. You learn to grow eyes in the back of your head, to read what is happening with people and to anticipate when things are about to go pear-shaped. Most of my hiking these days is as a couple or on solo hikes so now my focus from a safety/first aid perspective is in that direction. Traditional wisdom states the ideal group number for a hike is four people. The assumption behind this is that if one person is injured, the second person stays with them to care for them, and the third person and fourth person hike out to get help. This means no one is left alone. The concept is fine assuming only one person is injured at any one time and that the other three people have the skills and ability (which they should) to manage the situation. While this was more likely in the past, as hiking becomes more and more popular many people don’t possess either the navigation ability or the first aid management skills to deal with these situations particularly as guided trips become more common. As already mentioned I like solo hiking and it is not unusual for me to be totally isolated without another person anywhere within 30 km in any direction. In this situation, I need the confidence in my own skills, the ability to minimise the possibility of an accident occurring, and should it occur, be able to manage until help arrives. Planning is the key here but once you have planned to the best of your ability you then also must assume that accidents may occur that no amount of planning or skill can prevent. An example of this was a hike I did early last year with Gill who startled a brown snake asleep on the trail. Startled the snake proceeded to escape over my boots rather than strike at me which was sheer luck. Had it decided to strike instead, we were carrying, and both knew how to use the first aid kit as well as the Personal Locator Beacon (PLB) which would have been needed. Everyone, without exception, should carry a first aid kit whenever they leave the city confines to ‘go bush’. 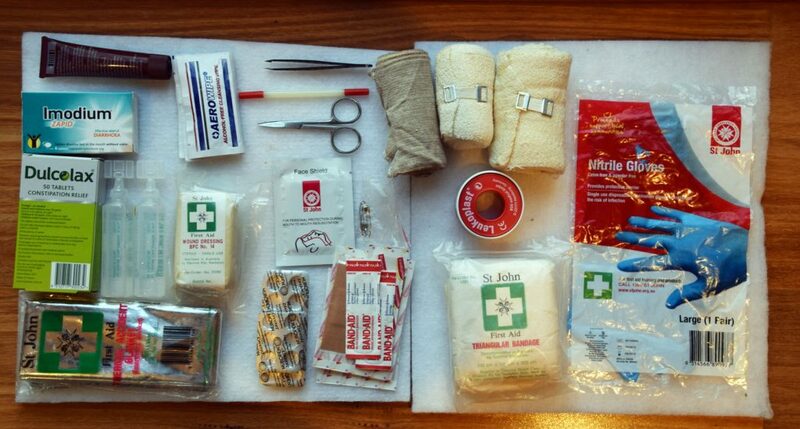 What this first aid kit looks like will depend on several factors. These include the likely issues that may arise, the length of the trip, what problems usually occur (e.g. blisters) and if there any known medical conditions. These factors may vary from trip to trip and group to group, and this may mean you need to reassess your first aid kit each time you go for a walk. Everyone should have their own first aid kit rather than relying on a single kit which may not go very far particularly when you start handing out Band-Aids to deal with blisters. The following items make up my first aid kit for an extended hike in a remote area. This kit as outlined below is the most that I ever take and weights in at 536 grams. In most cases this kit will suit when hiking with Gill so the weight becomes negligible when spread between the two of us. I store all this in a small soft pack that lives in my pack brain or just inside the top of the pack. 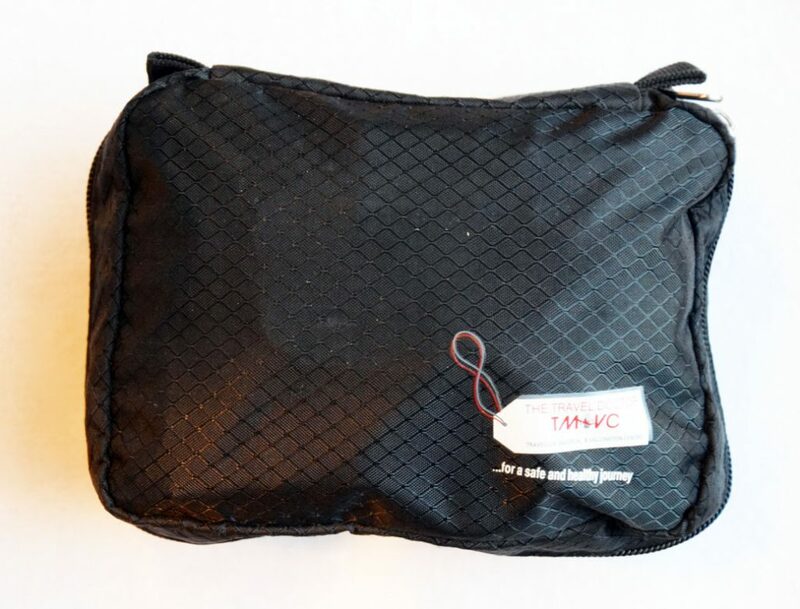 In addition, all the individual items that can be potentially damaged if they get wet are inside zip lock bags to keep them dry and in good condition. One thing to remember is that your kit needs to be checked on a regular basis as the medications will have a use by date, and after repeated trips items can degrade from repeated exposure to the environment. Whatever items you decide upon for your first aid kit, the golden rule is if you don’t know what it is or how to use it then don’t carry it. Disclaimer: The items listed above make up my personal first aid kit and have served me well over the years however you will need to assess what you carry based on your own needs. Be sure to consult with your doctor regarding medications. The more complex a trip and the smaller the number in the group, the greater risk of doing a hike. Just having a first aid kit is no use if you don’t know how to use the items or how to deal with medical situations when they arise. If you solo hike you are totally dependent on your own skills and ability to deal with any accidents that may occur so you had better know what to do if you are hiking in remote areas and this includes having appropriate first aid skills. If you are hiking as a couple or in a group then each member should have first aid skills just in case. There are range of First Aid providers in Australia running courses teaching basic first aid skills all the way up to more complex wilderness first aid for those who are really going remote in their trips. Hopefully you will never need to use your first aid skills but by having them you should be able to deal with any issues that arise as well as assist if an accident or injury does occur to another hiker. Having basic first aid skills is better than no first aid skills at all so if you haven’t already done so, book yourself in to do a course. Remote area/wilderness first aid courses don’t tend to be run as often as basic first aid courses so you may need to book well in advance to secure a place on one of the more in-depth courses. Once you have done a course you will need to update your skills every few years to maintain currency. The following is a list of just some of the first aid suppliers that may offer courses in your area. Contact your local trainers to see what they can offer. 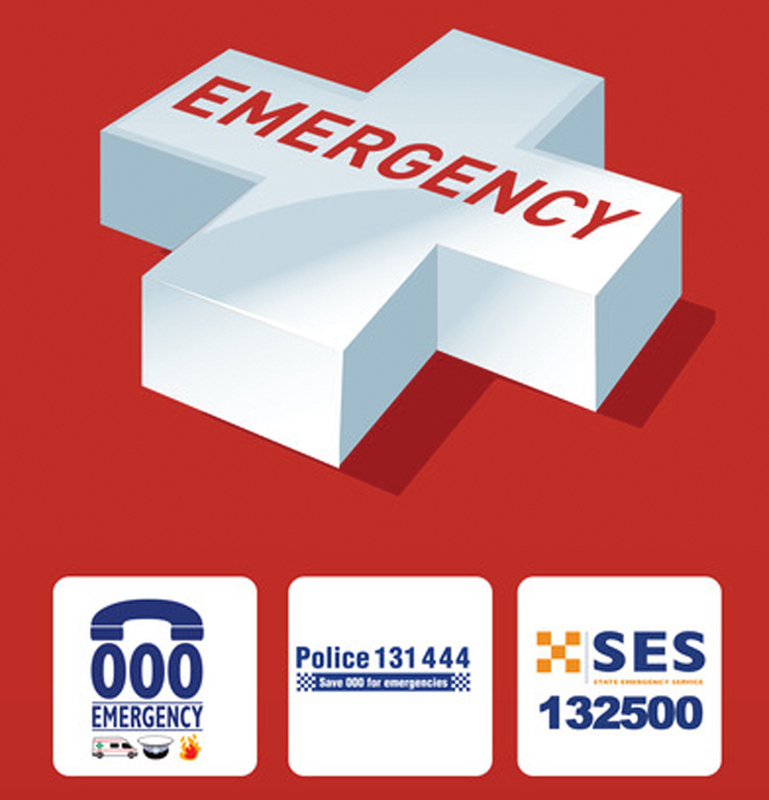 Emergency + was developed by Australia’s emergency services and industry partners. The mobile phone app uses a phone’s GPS functionality so callers can provide emergency call-takers with their location information as determined by their smart phone. Emergency + also includes SES and Police Assistance Line numbers as options, so non-emergency calls are made to the most appropriate number. This app needs a phone signal to work but is great for when you are in range and you need emergency assistance. In serious situations, the quicker that help can get to you the better the outcome. While it is all but impossible to rule out the chance of an accident or injury on the trail, you can minimise this chance through good planning. If an accident or injury does occur, then having the skills and equipment to deal with the situation is going to provide the best outcome. I issue a challenge to all the hikers out there; check your first aid equipment to make sure you know what’s there and that the items are in good condition. And do a first aid course or update your skills if it’s been a while, particularly if you are about to go on some grand adventure.